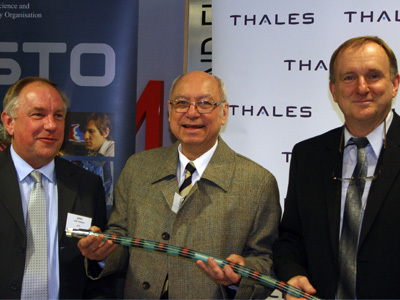 DST Industry collaborators on the fibre laser towed array project. DST welcomes opportunities to collaborate with industry including small to medium enterprises (SMEs) undertaking research that may be of interest to Defence. Industry collaboration is core to our strategy to build on our strength of being a valued advisor to government and to focus our efforts towards future Defence and national security capability. We leverage world-class capabilities, both in Australia and internationally, through our partnerships with industry. DST is interested in collaborating with companies (including SMEs) that have a research and development (R&D) capability relevant to our science, and where the company is willing to invest their own resources. Collaboration must deliver benefits to both DST and the commercial partner. Collaboration frameworks are being designed to incur low overhead and facilitate the quick establishment of joint R&D programs. For more information about collaborating with us, please contact our Technology Partnerships Office. Our strategic alliance program establishes and builds long term relationships with companies who have significant R&D capability across multiple domains and capacity to collaborate in areas of strategic significance to Defence. There is no funding provided to companies under the strategic alliance program. DST has entered into strategic alliances with a number of companies, including those below. DST Group and Airbus Group Australia Pacific have a strategic research and development (R&D) alliance in the area of defence aircraft systems and communications. DST Group and ASC have a strategic research and development alliance in the area of Collins Class submarine-related technologies. DST Group and BAE Systems Australia have a strategic alliance focused on conducting world leading collaborative research in defence technologies. DST Group and Boeing have a strategic alliance to conduct world leading collaborative research collaborative research in a range of defence technologies. The Defence Materials Technology Centre (DMTC) uses the Collaborative Research Centre (CRC) model to bring together industry, universities and research agencies. DST Group invites industry participation in a program whereby DST scientists and engineers can spend time working in industry. DST Group and IBM Australia have a strategic alliance to conduct collaborative research in a range of high-end defence technologies. DST Group and Lockheed Martin Australia have a strategic alliance to collaborate on a range of technologies for strengthening defence and national security. DST Group and Northrop Grumman Australia have a strategic alliance to conduct collaborative research in a range of high-end defence technologies. DST Group and QinetiQ Australia have a strategic alliance focused on conducting world leading collaborative research in defence technologies.